2016 Newest Version Revolutionary Tech for the Most Immersive Virtual Reality Experience! PU leather DIY 3D VR Box Google Cardboard Virtual Reality Glasses PU leather, providing long time comfort for wearing experience! Suitable for 4 inch - 5.5 inch screen cellphone,support Android and IOS. Control your phone easily with the button. Specially designed augment reality technology and high-definition optical lens, perfect for video, movies, games, etc. Improved lens parameter, eliminating the feel of vertigo. Easy to assemble within one minute for a convenient VR experience. Supports LR format apart from the usual video format. Effects of 3D images pretty good, bringing you awesome feelings. Simply assemble the glasses and lenses, download the VR app,and you will have a range of fantastic virtual reality experiences! Abundant VR Resources Available 1.VR games. Head-tracking is enabled. We suggest you to have an additional Bluetooth remote controller. 2.360 degree panoramic image or video: with head-tracking function, you can move your head to enjoy the scenery around. 3.3D movies or side by side films. 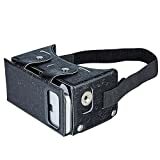 Package Include: 1 x DIY VR Headset 1 x User Manual 1 x Clean Cloth How to Use 1.Download VR resources from APP store, Google Play store, or from other websites onto your mobile phone. The VR resources must be split screen format. 2.Start the VR App and insert your smartphone. The headset supports 4.0-5.5 inch smartphones. 3.Enjoy your virtual reality world! Rather than wait for super expensive VR Glasses, experience the future now with the premium quality Fuleadture Google Cardboard! Click "Add to Cart" now!